This article will present a few different Single Sign-on (SSO) scenarios which should help you develop a strategy that will meet your single sign-on needs. Our employees who are all managed through Google G-Suite (this could also be Microsoft ADFS, Salesforce, Okta, OneLogin or any other user management system). Our customers who are all managed in our cloud-based web application. Drawing a simple diagram like this will make setting everything up correctly later on much easier. It is important to understand the single sign-on flow when a user is trying to access content on ScreenSteps. If a user tries to access a ScreenSteps site that has an SSO endpoint attached to it, then ScreenSteps will use that endpoint for user authentication. 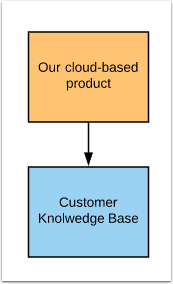 In the example above, we have attached an SSO endpoint to our customer knowledge base that points to our cloud-based product. When a user tries to access our Customer Knowledge Base then they will be redirected to our cloud-based product to login. If the ScreenSteps account has an SSO endpoint configured and the ScreenSteps site is the default account associated with the account then the account SSO will be used. If it does not then the standard ScreenSteps login screen will be shown. SSO will not be used. In the diagram above Google G-Suite as been set as the default for the account. 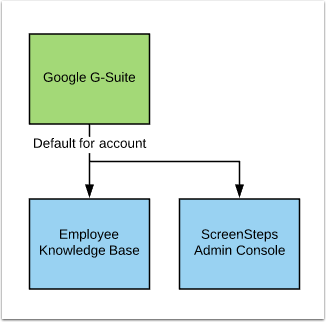 Even though the Employee Knowledge Base does not have an SSO endpoint attached to it, Google G-Suite will be used to log them into the knowledge base because it is the default for the account. If an account SSO endpoint has been set then it will be used for any access to the Admin Console. If an account SSO endpoint has not been set then the standard ScreenSteps login screen will be used. An existing user in your ScreenSteps account will be found or provisioned. The user will be added to the SSO user group unless they are already a member of that group. When a user logs in via an SSO endpoint ScreenSteps will look for an existing user with the same email address as the one provided by the SSO service. If that user exists then they will be logged in. If a user with that email address does not exist then ScreenSteps will create a new user record in ScreenSteps. It is important to understand that each time a user logs in using an SSO endpoint they will be added to the user group that is attached to that SSO endpoint. Hopefully this have given you a good understanding of how to organize your SSO setup with ScreenSteps. Please don't hesitate to reach out to support if you have additional questions. Prev: What is remote authentication? Next: How do I use Remote Authentication to access my sites or admin area?